Work Opportunity Reconciliation Act, more commonly known as "welfare reform." The welfare reform of 1996 sought to "end welfare as we know it," as President Clinton had often stated. The Winter 2016 issue of the Journal of Policy Analysis and Management has a "Point/Counterpoint" exchange on the effects, which at least for now is freely available on-line, although many readers will also have access through library subscriptions. The intellectual combat here isn't in the binary, black vs. white. fire vs. ice, war-of-the-worlds style. Instead, Ron Haskins takes the position the glass-half-full position in "TANF At Age 20: Work Still Works" (pp. 224-231), and then the team of Sandra K. Danziger, Sheldon Danziger, Kristin S. Seefeldt, and H. Luke Shaefer takes the glass-half-empty position in "From Welfare to a Work-Based Safety Net: An Incomplete Transition" (pp. 231-238). The authors then offer a response-and-rejoinder to each other, as well. “When the Senate passed, with a good bipartisan vote, with half the Democrats joining the Republicans, I began to think the President would sign this bill . . . July 31st has got to go down as Independence Day for those who have been trapped in a system that has been left dormant and left to allow people to actually decay on the layers of inter-generational welfare which has corrupted their souls and stolen their future . . . It will work ..."
In terms of nomenclature, the previous welfare program called Aid to Families with Dependent Children (AFDC) now became Temporary Assistance for Needy Families program (TANF). The change in name was mean to reflect a change in emphasis. AFDC had been an "entitlement" program, meaning that if you qualified for the program as a low-income family with children, you were entitled to the payment. The central change in TANF was that welfare became a work-based program. Recipients now had to either work or be preparing for work through education or job training to be eligible for welfare. In addition, time limits were placed on the length of time welfare could be received during a lifetime. The welfare caseload, which had increased almost every year since the beginning of the War on Poverty in the mid-1960s, fell every year after 1994 before increasing slightly during the Great Recession of 2007. Over the six years between 1994 and 2000, the caseload fell by about 60 percent to a level roughly equal to the 1971 level. 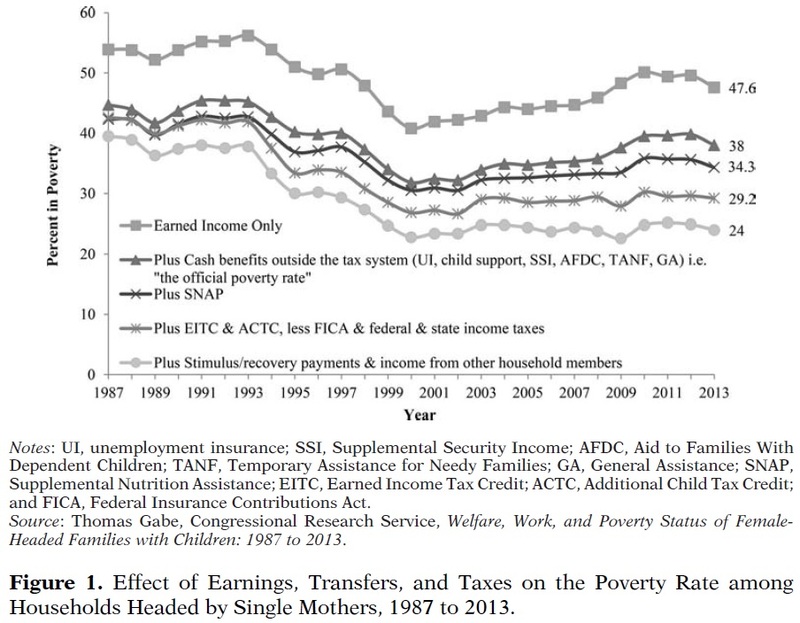 The decline in the rolls over this period was accompanied by a 16 percent increase in work by all single mothers and a 35 percent increase in work by never-married mothers, the subgroup of single mothers who were most likely to go on welfare. Meanwhile, the poverty rate among single mothers and their children fell from 44 percent to 33 percent, a decline of 25 percent to its lowest level on record. Moreover, poverty rates among the key group of households headed by single mothers. Here's a figure from Hansen's paper. The top line shows the poverty rate in this group if you look at earned income only. The next line down shows the poverty rate if you include cash benefits including TANF, but also unemployment insurance, general assistance, Supplemental Security Income, and others). The next line down adds in the value of food stamps. The line under that adds the value of the Earned Income Tax Credit. The bottom line also adds income from other household members and government stimulus/recovery payments. Right after 1996 welfare reform, the poverty rate for this group declines, and at least according to the bottom line in the figure hasn't changed much since then. But of course, nothing is truly simple in social science. As all the authors in the symposium point out, the welfare reform law of 1996 was operating in a broader economic and policy context. The economic context was the dot-com boom of the late 1990s. When President Clinton signed the welfare reform law in August 1996, the unemployment rate was 5.1%, and it would fall all the way to 3.9% by late in 2000. In other words, it was a good economic time to impose work requirements. The policy context was that the shift in welfare from AFDC to TANF was accompanied at about the same time by a substantial shift in other programs to provide work support. As the Danziger et al. 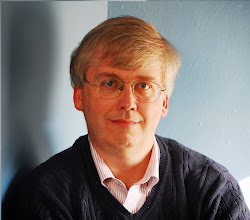 team of authors point out, "For example, the Earned Income Tax Credit (EITC), which provides tax credits to families with children and low earnings, was increased significantly in the early 1990s, the minimum wage was increased in 1997, and access to medical care was expanded by the State Child Health Insurance Program of 1997." For an earlier post about how a Congressional Budget Office report on how government work-support programs largely offset the falls in welfare payments, see "Where Has Welfare Reform Taken Us?" (January 23, 2015). The broad shift to work requirements as part of welfare remains popular, and on its own specific terms, successful. Both sets of authors in this symposium support the shift, which represents a real change from how welfare was regarded before 1996. As Haskins writes: "Low-income working families with children receive more help from government than ever before—and there is bipartisan agreement that this is good policy." But the shift raises some obvious questions. What about assistance to those adults who are disconnected from work and don't have children, or to parents who are disconnected from work and do have children? 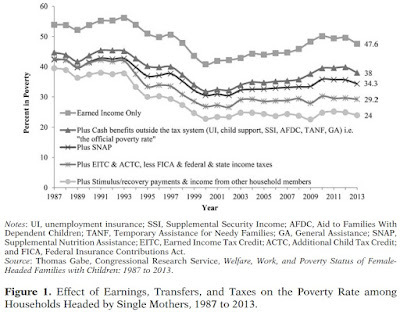 And given that nearly half of all households headed by single mothers do not earn enough to be above the poverty line based on their own income, as shown in the figure above, what can be done to raise the payoff for low-skilled and low-wage work? 1. Adoption of a public responsibility to provide work opportunities to those for whom employer demand is limited, especially when unemployment is high. This includes transitional jobs or public subsidies to private-sector firms, nonprofit agencies or government agencies. 2. Expanded child care subsidies. 3. Reducing barriers to TANF entry by requiring states to spend a larger fraction of block grant funds on cash assistance and raising the TANF block grant to reflect economic and demographic changes. First, because the federal minimum wage has not increased since 2009, an increase would reduce earnings poverty for single mothers, who are disproportionately represented among minimum wage workers. The Congressional Budget Office (2014) estimated that a $10.10 per hour wage would raise earnings for 16.5 million workers and reduce poverty by about 900,000, while reducing employment by about 0.3 percent (about 500,000 jobs). Third, Ziliak (2014) proposes to convert the Child and Dependent Care Credit from a nonrefundable to a refundable credit. For example, for children under the age of five whose families have less than $25,000 in adjusted gross income, the refundable credit would be $4,000 for the first child in a licensed facility and half that for a child in an unlicensed facility. Low-income families do not benefit much from the current credit because they have little taxable income. Fourth, families with incomes below $3,000 do not benefit at all from the $1,000 per child tax credit and other low-income families do not receive the full credit because their income tax liability is lower than $1,000 per child. The Center for American Progress (2015) has proposed making the credit fully refundable. This would provide needed cash income for the disconnected and additional income for TANF recipients, particularly if the credit could be delivered on a monthly basis. These changes are essentially incremental. For example, proposals like a substantial increase in the Earned Income Tax Credit for all recipients are not includes. Moreover, I don't think of all of these changes as being work-related: for example, making the Child and Dependent Care Credit refundable doesn't encourage work in any direct way. Nonetheless, I'm broadly sympathetic toward proposals that support the households of low-income workers, and especially those with children.